A working class tenant describes how landlords in Tekhand try to squeeze extra money by using the tenants’ dependency on water and electricity – and how collective steps of tenants can undermine this. Eleven short workers’ reports on conditions in Gurgaon’s factories, amongst others at Adigear (Puma, Adidas), House of Pearl (JC Penny), Modelama (GAP, Old Navy). 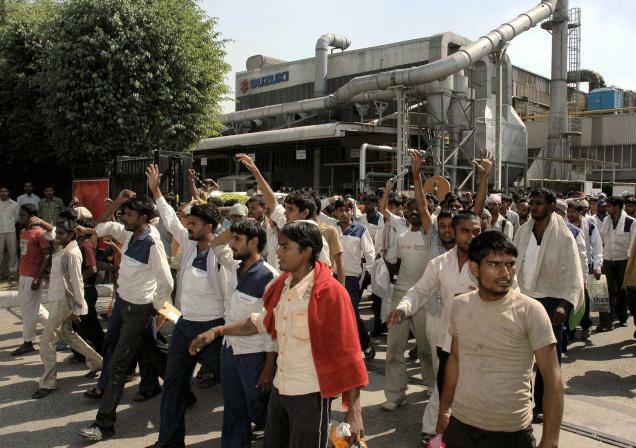 Between June and October 2011 thousands of workers took part in factory occupations, wildcat strikes and protest camps at Maruti Suzuki and other automobile factories in Manesar, near Gurgaon. We document further material on this important strike and call for an open debate about the lessons of this dispute. We translated two long articles published in Faridabad Majdoor Samachar providing important new details and summarised some material about the general context of the struggle. In April 2011 a dispute erupted at the factory of the health equipment manufacturer Harsoria. After initial collective steps on the shop-floor and a 72 hours factory occupation, workers followed the legal order and union advice to leave the factory. They were attacked by the police and had difficulties not to get entangled in conflicts of factory union representatives, regional union leaders and company management. Religious sects like Brahmakumaris and Radha Soami Panth not only engage in commodity production by selling products for ‘spiritual tourism’, they get directly involved in management of industrial relations and education of manual workforce. After lockouts at Denso in 2010 and Maruti Suzuki in 2011, the multi-national management engaged Brahmakumaris to deal with the agitated ‘human capital’, while the Radha Soami Panth supplies semi-skilled young workers to companies like Honda Motorcycle and Scooter India (HMSI) in Manesar. A workers’ report describes the ‘spiritual-industrial’ connection.